change the way oil/fuel spills are handled in the future! 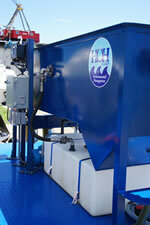 HOH Corporation (a leader in the design & manufacturing of Oil/Water Separators for 20 years) developed the SKIMSTER® OWS for small to medium sized oil/fuel spills for the marine industry. We saw a need for a more compact system that could easily be transported to an oil/fuel spill, a system that could be setup and respond quickly, a system that would clean the oily wastewater to <15PPM oil-in-water and finally a system that is affordable. 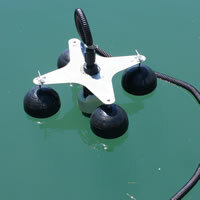 The SKIMSTER® OWS has met all our requirements and expectations!! The skid-mounted SKIMSTER® OWS can easily be transported to oil/fuel spills on its 7’x16’ duel axle trailer (V-Nose Cargo Trailer is optional), powered either by its supplied 115V Electrical Panel or by your own portable generator (if no power is available at spill site). Along with HOH’s patented CUBE© Coalescing Media (we have given the system 4X the coalescing media for added retention time), the system comes with a Hydrocarbon Polishing Filter System to achieve the <15PPM Oil-in-water effluent required by US Coast Guard. The SKIMSTER® OWS can also be used as a fixed/permanent Oil/Water Separator System for industrial sites requiring the <15PPM. Download the manual (pdf) here. 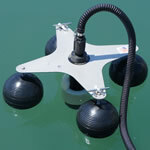 Place the SKIMSTER® Floating Oil Skimmer inside the contained spill. The SKIMSTER® powered by the Electric Diaphragm Pump begins feeding the CE-10M Oil/Water Separator with the oily wastewater for separation (prior to entering the CE-10M the oily wastewater passes through a 20” Basket Strainer to filter out any solids/debris). The oily wastewater passes through HOH’s Patented CUBE® Coalescing Media where the oil droplets form and rise to the surface of the separation chamber where it displaces the water. As the oil layer increase the oil spills into an Adjustable Rotary Pipe Skimmer where it will flow by gravity to the oil storage reservoir (placed beneath the CE-10M) for recycling. 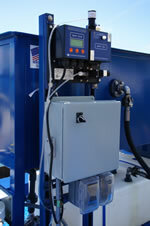 The clean/separated water now enters the effluent chamber of the CE-10M. The clean/separated water is then pumped through the Dual Hydrocarbon Polishing Filtration Canisters for final polishing to <15PPM oil-in-water. The polished water enters the River Trace “Smart Cell” Oil Content Monitor for final monitoring of the water. The polished water can be discharged (check with your local regulatory agency for discharge limits) or in many applications the water can be reused /recycled. HOH Corporation is proud to offer the SKIMSTER® OWS as a “Made in America Product” - designed and manufactured at our facility in Winston-Salem, North Carolina. 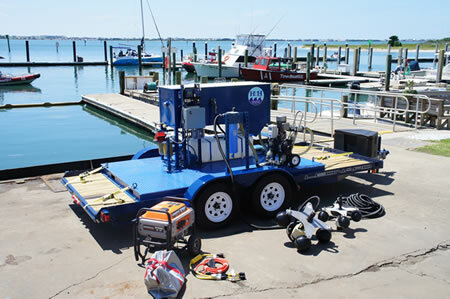 Building wastewater systems for 20 years (and operating a “Centralized Waste Treatment” facility of our own for over 10 years), has given HOH the knowledge and experience to offer a logical/easy to use/affordable product for the marine industry. 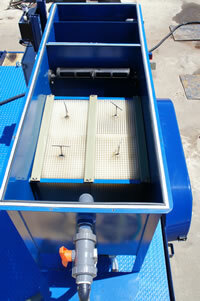 We look forward to working with you on all your wastewater needs.